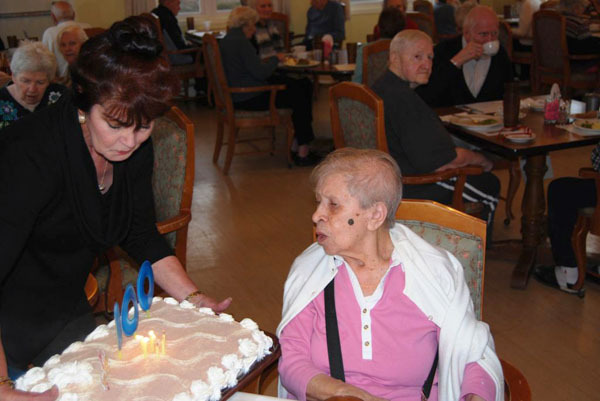 On January 26, Maria Teresa "Tess" Brana celebrated her 100th birthday with fellow residents at McPeak's Assisted Living. After lunch, the residents sang "Happy Birthday" to Ms. Brana and were treated to birthday cake. Ms. Brana was born on January 26, 1912 in Italy. When she was eight years old, her family came to the United States and moved to the New York City area. She worked at her family's candy store before becoming a retailer at Macy's, where she worked for 30 years. She said her strong work ethic helped to contribute to her longevity. On January 15, 2009, Ms. Brana came to McPeak's. She became one of the more active residents as she helps decorating the facility for holidays and special occasions. She also enjoys the pet therapy sessions at McPeak's and, whenever she sees a dog, likes to pet and talk to them. McPeak's Assisted Living resident Maria Teresa Brana (right) blows out the candles on her birthday cake that was brought over by Linda Ohlsen (left), Activities Director, McPeak's, during Ms. Brana's 100th birthday celebration on January 26.